There are many complex objects and machines in the world – ships, aircraft engines and petrochemical plants to name three that have always fascinated me. Determining what such an intricate machine or facility is doing at any given moment, or even more importantly, what it will do in the future, is not easy. But that crystal ball may be closer than you think. What if we could simulate that machine or system digitally? If we could build an exact digital replica of say, a gas turbine, and feed it data so that it behaves like the real thing, we could learn how it may change under varying circumstances and even predict what it will do next. The good news is that this is already possible with Digital Twin technology. Digital Twins are digital replicas of physical assets, processes and systems that also interact with the real system – with the digital replica mimicking changes as they occur in the actual physical system. The concept has been around for some time now, but it’s the only thanks to the availability of cloud computing and the resurgence of Artificial Intelligence that it’s become cost effective to implement. General Electric is one of the pioneers of this technique. It has built Digital Twins of critical jet engine components that predict their remaining life and the optimum maintenance intervals. Digital Twins provide up-to-date and customized information, allowing these engines to be managed for maximum profit and performance while ensuring passenger safety. And this idea is not limited only to discrete, self-contained objects like engines. 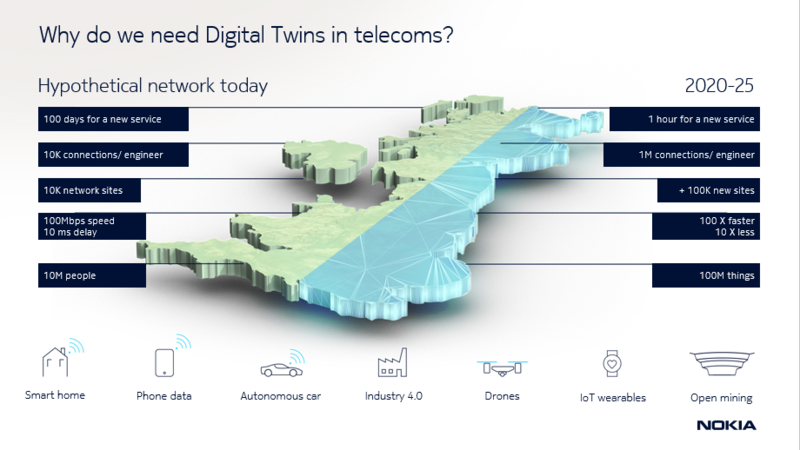 Telecom networks, which are infinitely more complex - can also have a Digital Twin. As operators add layers of technology, utilize additional spectrum bands, offer more services and connect more devices, the burden on their operations teams increases and IoT and 5G will accelerate this trend. Consider the hypothetical example of a network that today has 10,000 base station sites serving 10 million human subscribers. By 2020-25 this network will need 100,000 extra sites to support 100 million new connected IoT devices, and advanced 5G use cases requiring 10 x lower delay and 100 x times faster data speeds. This ever-increasing complexity will test the limits of human ability and decision-making. One answer is to use Digital Twin representations of the real world. Everything can be used to feed into these simulations - the physical environment, usage at different locations, mapping, buildings, vegetation lifecycles, historical weather conditions and the location of street furniture. When it comes to network planning and optimization, a Digital Twin goes far beyond current software tools. Unlike traditional techniques, it incorporates everything that affects the network including data about where and how people are using it, as well as trends gathered from social media. Nokia is already making great progress here. It has many of the components on hand in the form of geolocation tools, predictive analytics, as well the ability to map cityscapes in 3-D and the location of vegetation and trees that affect radio signals. Yet, no single company can do this alone. Cooperation is vital if Digital Twins are to fulfil their promise, and Nokia is already working with a wide range of partners to make this a reality for telecoms. Please get in touch if you’d like to know more about our vision for Digital Twins in telecoms. Want a glimpse of what Digital Twins could achieve? Watch the video to discover how the future network will be managed.